A US military victory in Iraq is now impossible. Says who? No, not just those damn pinko Saddam apologists at the Stop the War Coalition. 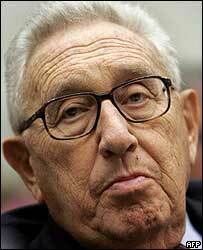 Henry Kissinger, that’s who. PS: I still rate Christopher Hitchins's 'The Trial of Henry Kissinger' - probably the last book he wrote while he was still on our side - as one of the best sustained volumes of investigate journalism combined with political polemic I have ever read. Truly stunning stuff.